Here is what we know: Google and Twitter are partners. Here is what we don’t know: The impact this will have upon search/social marketing. In February, Google and Twitter agreed to a partnership that gives Google access to Twitter’s firehose, which is the term for Twitter’s stream of Tweets. What is Google going to do with this information? The answer seems obvious. 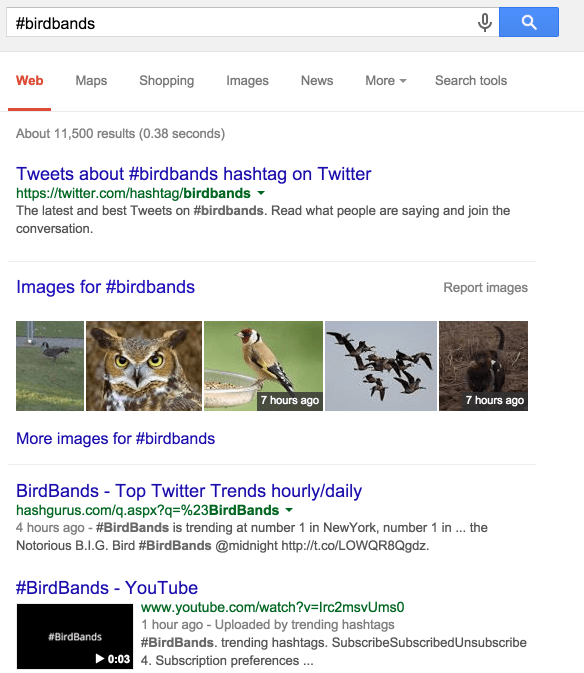 They will provide tweets in the SERPs for real time search results, right? After all, Google is a search engine. Most likely, yes. But the fact is, we simply don’t know. Google is a search engine, but they’ve also made a pretty darn big social media platform, smartphone platform, and operating system among other things. They’re even involved in space travel. Whatever they plan to do with it, we will probably find out in the next few months. Right now, however, we can prepare. And what should we do to prepare? Since we don’t know how Google will be applying firehose information to their search algorithm, we must focus on the broader issues of search and social. This article does not promise the end-all solution, but it is an attempt to help marketers get ready for whatever is coming. We might as well begin with the basics. Social and search are merging. This is no longer pie-in-the-sky conjecture. It is the reality of the here-and-now. Already, social platforms have robust search algorithms built in to them. Facebook’s innocuous search bar can turn into a powerful social search. An advanced search can produce surprisingly focused results. I can even find friends who aren’t my friends. 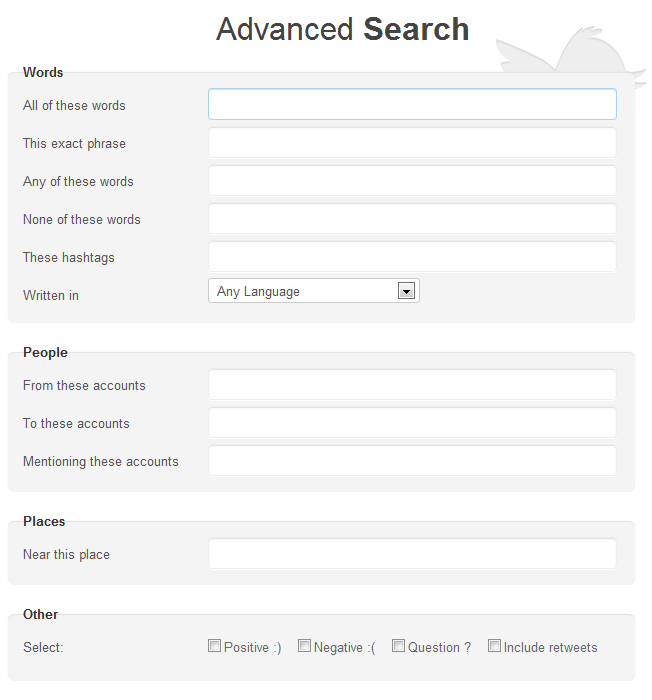 Twitter’s own advanced search provides even more flexibility. Twitter search can produce results with positive emotion, negative emotion, or questions. For Google users who are logged in, Google already returns Google+ results, which includes detailed contact information on users. When I search for the name of someone in my Google+ circles, I get proprietary results drawn directly from my personal network. With Google and Twitter’s tighter relationship, we can now expect the existing search power of Google applied to Twitter in new and surprising ways. Social media professionals should understand how search works, both from a social perspective and from a search engine perspective. Having an understanding of search will enable social media strategists to further advance the findability of their brands and specific social media campaigns. Digital marketing professionals have long struggled with identity crisis, trying to determine how broad or deep they should be. Those who prefer specialized roles tend to clash with those who are digital marketing jack-of-all-trades. SEOs are told that they aren’t actually SEOs, and marketers and agencies alike are trying to shape up into a T.
Whether you’re a search professional or a social professional, you should realize that the boundaries between the two are blurred. Search professionals should understand how social affects their role. Social professionals should realize the impact of search upon their role. Both must acknowledge that the lines of the playing field are being redrawn in new and startling ways. Admittedly, this is a broad application, but it’s one that I must insist on. Twitter and Google’s partnership sends a clarion call to the digital marketing world: Social matters. Big time. Brands — from enormous companies to individual personalities — must have a social presence. But social presence isn’t enough. It’s now necessary to have an ongoing methodology for advancing a social media agenda. In the early days of the web, a business thought that it was doing a good job simply by having a website. Websites were digital placeholders. Then around 2009 we realized that brands needed to produce content on a regular basis! The blog boom was born. 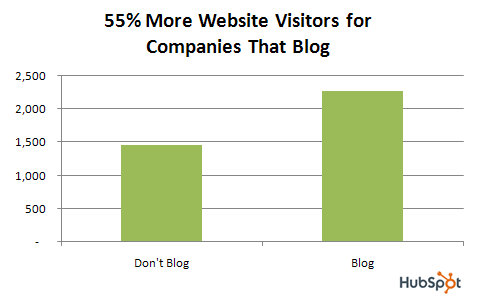 Greater indexation, more pages, more visitors, more leads, more revenue — good things came to those who blogged. We’re in a similar situation with social. A company that lacks a consistent output of social content isn’t going to last in the world of social. As Google and Twitter merge their vast user bases and algorithmic technology, we’re going to see the importance of real time social search results. Let me be very clear: Tweet regularly. Tweet often. Tweet a lot. Keep your social output consistent and regular. Presumably, the better your posting velocity, the more likely you are to gain the right kind of attention and traffic. Hashtags will become more important than ever. It’s likely that hashtags will help to drive search queries and Google’s search results. This is, admittedly, conjecture, but it seems likely that if tweets are part of the search results, then hashtagged terms within those tweets will also be searchable and visible. It’s not a leap of logic to assume that any hashtagged queries will also produce additional Google results. 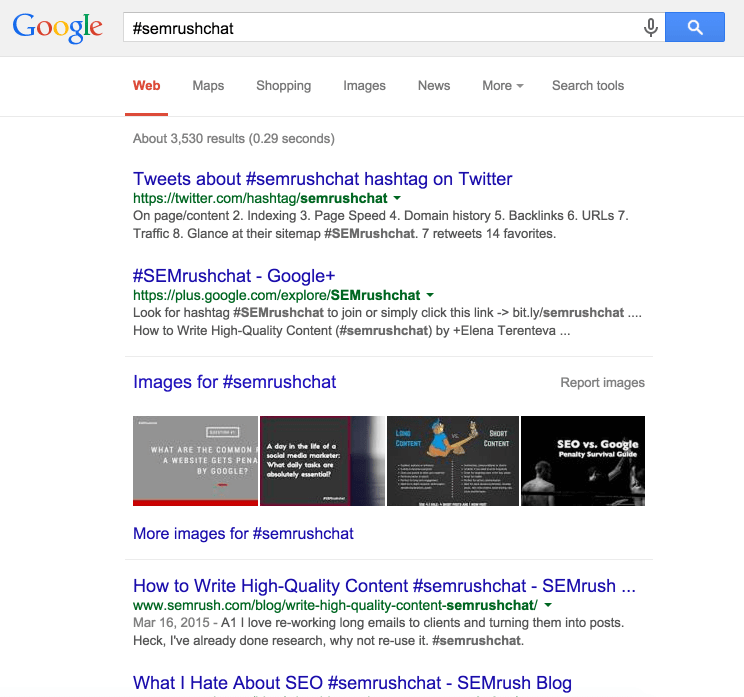 The top result for #semrushchat is a Twitter page with that hashtag. 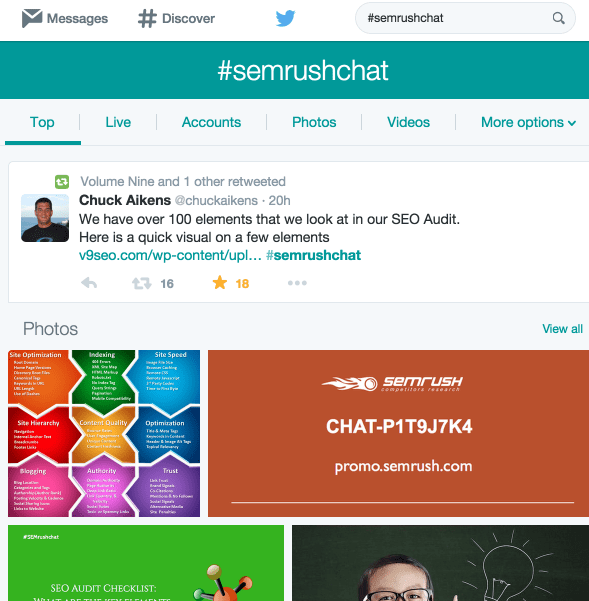 SEMRush hosts Twitter chats, so the hashtag #semrushchat has plenty of action, images, and updates. Hashtags are the new keywords — not just for social activity, but search activity, too. Since all the major social platforms use hashtags, Google search has been forced to adapt. Now, your brand must adapt, too. Creating unique hashtags and capitalizing on the use of those hashtags will put you in a strong position to gain additional visibility and exposure s Google rolls out the application of their Twitter partnership. For a quick visual summary of hashtags, check out this hashtag infographic. Users love it, too. Twitter trends are a way to discover what’s hot on Twitter. Trends can easily explode into worldwide sensations. As Google jumps into the game, Trends will become even more significant in their real time search application. Google can ascertain what topics are trending, but not with the same instantaneous algorithmically-powered accuracy that Twitter has. 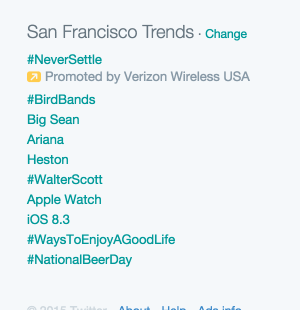 A Googled trending hashtag can’t compete with Twitter’s live stream. 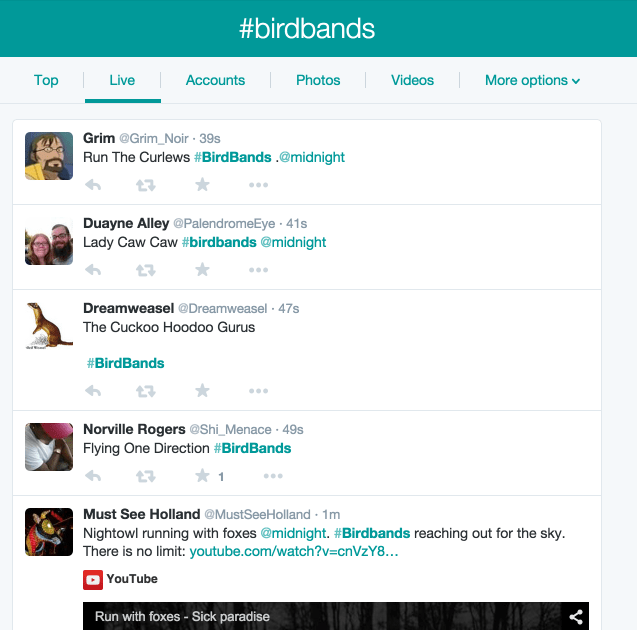 You get the idea that #birdbands is trending, but you don’t know why — not at a glance anyway. Searching on Google means that you won’t get the joke at first. Searching on Twitter gives you complete understanding. As Twitter and Google cozy up, Trends will be bigger and better than before. 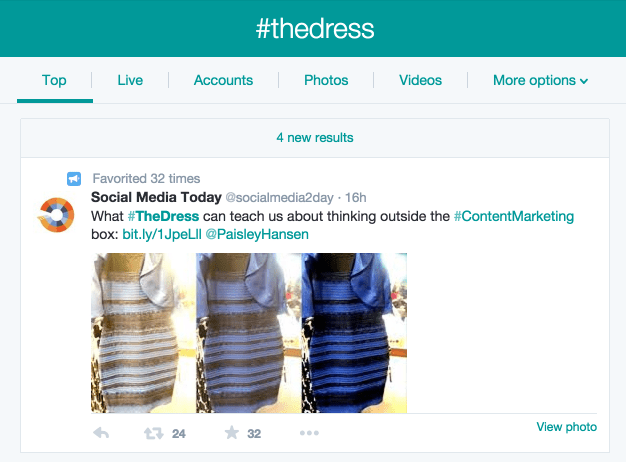 Twitter’s recent mobile changes mean that trends are more apparent and easier to find. As Google brings these trends into search visibility, we can expect it to improve even more. It will be interesting to see how the Google and Twitter partnership will affect the impact and ROI of social media. In light of the coming change, keep close tabs on your social media record keeping. Be sure to align your social media efforts with your company goals. To this end, it will be helpful to inform your company’s search marketing team of the efforts. My final recommendation is perhaps the most significant, but also the most obvious. Keep using Twitter. If Twitter is partnering with the king of search, there is no way that the 14-character social media platform is on the decline. This is the perfect opportunity to beef up your Twitter profiles, ramp up your tweet velocity, and strengthen your strategy. Search and social are finally getting together, and it can only mean good things for social media marketing. What do you think will be the biggest impact of the Google/Twitter partnership?